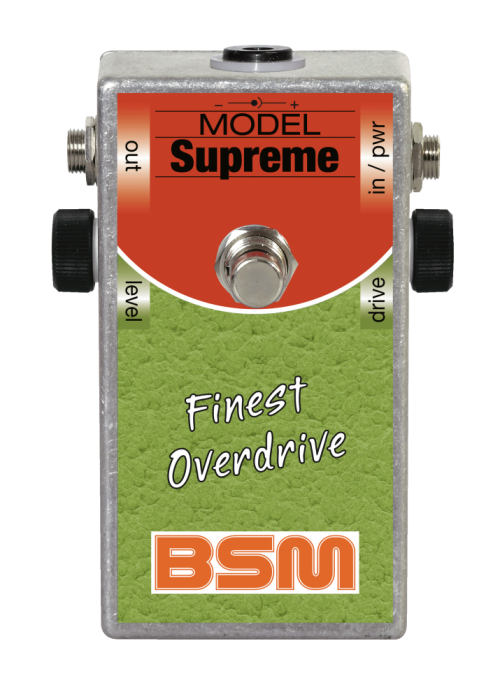 BSM decided to build a significant boutique overdrive pedal in order to add a different and more modern way of receiving the signature Blackmore sound additionally to the classic BSM full power Booster line: the SUPREME! If combines the medium output of an overdrive pedal with the typical Blackmore sound, so as to achieve Ritchie’s tone immediately with most amps bright channel independently from the SUPREMES’ output adjustment. The drive-control is there to set perfectly Ritchie’s gain-shadings over the last four decades of his rock-artistic development. The basic tone is very beefy with direct bass, punching mids and uncoloured treble. BSM determined to deliver only one distinctive sound and therefore to do without a tone-control. Apart from that the unit features the well-known crunching overdrive charm with a little compression, just uncompromisingly tuned to Ritchie’s tone. To achieve the typical sound historical correct low/medium output pickups incl. the Lace Sensor Golds are highly recommended. Each unit is a hand built unique with point-to-point wiring, premium quality parts and has a true bypass switching. The magical tone of the Supreme overdrive is achieved by the interaction between guitar pickup, booster and amplifier. The Booster should be connected in the signal path directly behind the guitar. The Supreme is powered by a 9V battery or external 9V power supply with a current consumption of approximately 3mA. Lace Sensor Gold is registered trademark, which BSM is not affiliated with! If you have any questions concerning our products, especially the BSM SUPREME special overdrive, our tech-head and mastermind Mr. Bernd C. Meiser would be happy to talk to you. So don't hestitate any longer and send him an email to info@treblebooster.net or use the contact form to contact him.